In spring it is the dawn that is most beautiful. As the light creeps over the hills, their outlines are dyed a faint red and wisps of purplish cloud trail over them. In summer the nights. Not only when the moon shines, but on dark nights too, as the fireflies flit to and fro, and even when it rains, how beautiful it is! In autumn the evenings, when the glittering sun sinks close to the edge of the hills and the crows fly back to their nests in threes and fours and twos; more charming still is a file of wild geese, like specks in the distant sky. When the sun has set, one’s heart is moved by the sound of the wind and the hum of the insects. In winter the early mornings. It is beautiful indeed when snow has fallen during the night, but splendid too when the ground is white with frost; or even when there is no snow or frost, but it is simply very cold and the attendants hurry from room to room stirring up the fires and bringing charcoal, how well this fits the season’s mood! But as noon approaches and the cold wears off, no one bothers to keep the braziers alight, and soon nothing remains but piles of white ashes. 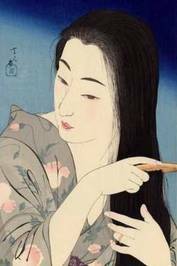 Sei Shonagon (c. 966 -1017) was a Japanese author and court lady who served the Empress Teishi around the year 1000 during the middle Heian period. She is best known as the author of The Pillow Book from which this passage is drawn. This entry was posted on May 8, 2016 by Vox Populi in Opinion Leaders, Personal Essays, Poetry and tagged Pleasing Things, Sei Shonagon.